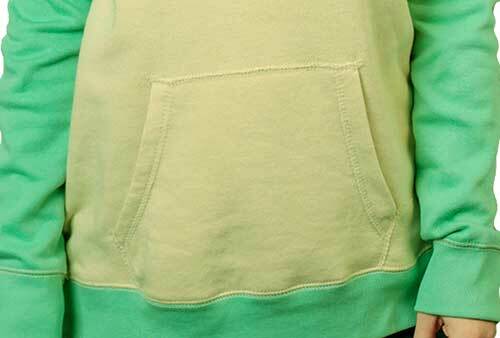 This woman's Irish sweatshirt features contrasting raglan sleeves along with a V-neck with raw edge 1 x 1 rib knit insert detail. The Irish hoodie is offered in women's sizing and it is from MV Sport for great quality along with combed cotton for maximum softness. This women's Irish hoodie is an embroidered natural and green color pullover with Celtic knot-work along with the Claddagh and shamrocks. 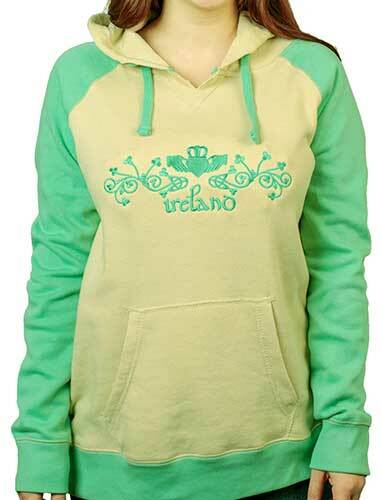 The woman's size Irish sweatshirt features a front pocket along with a Jersey lined hood with a contrasting drawstring; it is made of a super soft 55/45 cotton and polyester blend. 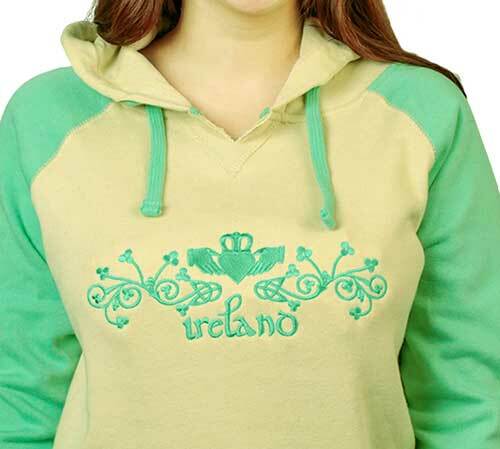 The Irish sweatshirt for women is embroidered in the United States and it is received with a Claddagh legend card along with shamrock and Celtic knot history cards, complements of The Irish Gift House.